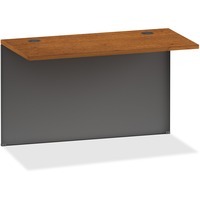 Lorell CherryCharcoal Bridge LLR97126 $162.29 Bridge is part of the Lorell 97000 modular desk series with commercial quality performance and components. Durable steel chassis supports a 1 18 thick, laminated top with two integrated grommets for wire management. Laminate is stain resistant and scratch resistant for durability. This 42 wide bridge can be combined with single pedestal desk or single pedestal credenza to create a U station. Mount on the side with no pedestal to avoid interference. Built in cord management provides easy access to power and data while minimizing clutter. Rich cherry laminate and charcoal paint create an upscale look and feel for any application.